The Fellowship was fortunate enough to obtain a copy of REANIMATOR #1 from Dynamite Entertainment. Keith Davidsen writes, Randy Valiente draws and Jorge Sutil colors. Susan is a lab tech at a New Orleans biotech company. She earns a little cash on the side by swiping and selling meds, until her final deal goes wrong and she’s rescued by an odd doctor named West. He hires her on the spot as a lab assistant, and she learns a great deal about his research. One day an experiment breaks loose, and when she traps the beastie she finds a secret that changes everything. I admit I was skeptical at first about the return of Herbert West, but this first issue has won me over. West makes a crack about having cured himself of his madness, and he seems to have some social skill (unlike previous incarnations). And Susan is a good character too, providing both a useful sidekick for West and an interesting source of story leads. The art is very nice as well, though I suspect that we’ve barely scratched the surface in that respect. There’s a lot going on in Herbert West’s return, and he might not even be the villain in this story. That alone makes it worth a read. So go read it. 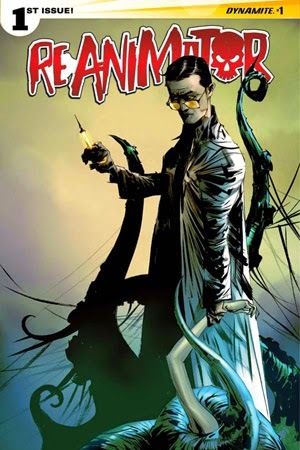 REANIMATOR #1 is available now at your FLCS or at dynamite.com.